Home/Facebook, Online Presence, Social media strategies/What’s the Difference Between Facebook Profiles, Pages and Groups for Business? Facebook Profiles, Pages and Groups: What Do I Need for my Business? Yes – it can be confusing! Facebook profiles, pages and groups have many similarities, making it hard to see the differences and figure out what exactly you need to create to grow your business… especially if your business is pretty new, or you are new to the social media world. And yet – each of these free Facebook features has its unique purpose and benefits. Once you understand the differences, you can start using Facebook profiles, pages and groups TOGETHER to establish long-term connections that turn into leads, referrals and loyal paying customers. 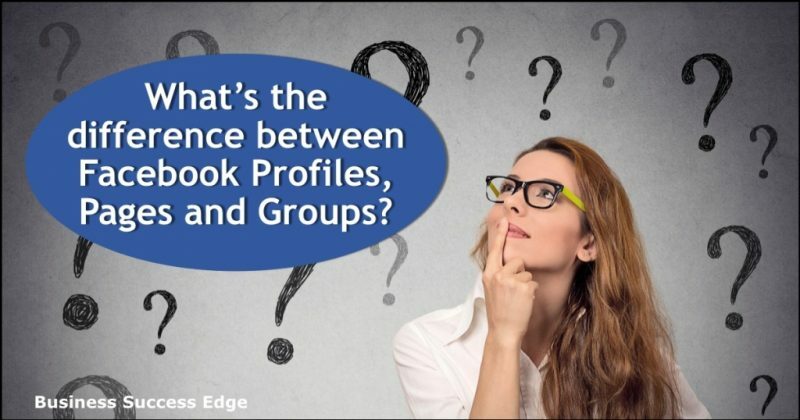 What’s The Difference Between Facebook Profiles, Pages and Groups? Your Facebook personal profile is your starting point on Facebook (you must have a personal profile to be able to do anything on Facebook). Personal profiles represent individual people (not businesses) and should not be used for commercial purposes. The main purpose of your profile is to establish your presence on Facebook and allow you to connect with other people and businesses. Your personal profile gives a glimpse into who you are: your likes, thoughts, and daily happenings. You get to post pictures, videos, links, updates and can control who this information is shared with. Facebook fan pages (otherwise known as business pages) are similar to personal profiles but are created for businesses, brands, and organizations. Your fan page is a mini-website for your business on Facebook. It’s your professional façade, and you should definitely create a Facebook fan page if you want people to take you and your business seriously. There are multiple other good reasons why you must have a well-branded and active fan page. It allows you to run promotions, it gives your business a huge SEO boost, and you can get detailed insights into your followers’ behavior and demographics… just to name a few. However, one downfall of a fan page is that you will most likely have one-sided conversations on your page. The way it usually works is that you make posts to your page and your fans and followers engage with them by liking, commenting and sharing. Facebook pages, however, are not really designed to have discussions, especially on sensitive topics (after all, everything that gets posted on your fan page is public). While it’s great for visibility and SEO, it’s not always the best for creating relationships and connecting on a deeper level. Another downside of only using pages to promote your business is that you will have a limited reach for your posts. Facebook currently shows your posts to less than 10% of the people who liked your page. Facebook groups, on the other hand, are perfect for having conversations, building connections and sharing your offers. Facebook Groups are communities and discussion forums created by Facebook users. They are usually formed around an interest, goal, or opinion, and can range in size from a handful of people to tens of thousands of members. The group administrator can decide to make a group open, closed or private, limiting who gets to see posts inside the group. In the last couple of years, Facebook groups became the virtual social hubs for connecting and networking on Facebook. You participate in groups as yourself – using your personal profile, thus allowing other people to get to know you better as a person. After all, we do business with people we know, like and trust. Facebook groups have stronger organic reach than Facebook pages, and all members of a Facebook group get notifications of conversations happening in groups they belong to (unless they change their default preferences). The search functionality available in groups allows members to easily find relevant discussions, as opposed to “now-you-see-it-now-you-don’t” behavior of fan page updates in your newsfeed. The bottom line is – engaging in Facebook groups is a highly effective way to reach your ideal customers and network with other business owners in just minutes a day. So What Do I Actually Need to Grow My Business? The answer is simple. If you are serious about growing your business – you need all three. Here is an example from the corporate world that might help you. Your Facebook personal profile is your “home.” You choose who is invited to your home, and how much you tell other people about your personal life based on your relationship with them. Your Facebook fan page is your “office.” You get to sit at the big desk, and set up the tone of any conversation happening in your office. You get to decorate it the way you want, and it’s pretty obvious to other people that it’s your working space. Facebook groups are all of the formal and informal “meeting spaces”- from the official board room, to informal meeting rooms, hallways, lunchroom, water cooler, and the after-hours neighborhood bar. That’s where a lot of real conversations and connections happen. That’s where you get to know people on a personal level and decide if you want to do business with them. Want to Learn How to Get Clients from Facebook Groups? As you can see – you actually need all three to get ahead of your competition. This means you need a social media strategy that encompasses all three of these Facebook functions. You must set up your Facebook personal profile to have an account on Facebook. You will also need it in order to create pages or groups. 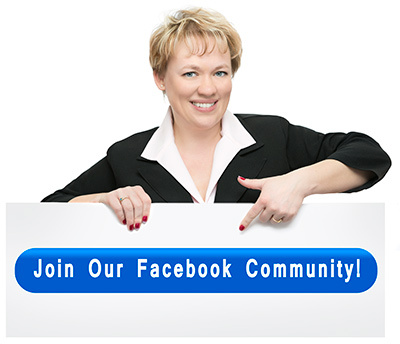 You should set up your Facebook Fan page to serve as the official profile for your business. And you should definitely participate in Facebook groups to network and connect with potential clients (and maybe even think of creating your own Facebook community). Together, Facebook profiles, pages and groups give you a perfect balance of formal and social interactions. Learn how to use them effectively IN COMBINATION with each other, and you have found the “magic formula” of growing your business on Facebook without spending any money on Facebook Ads. Want more blog posts like this one? Sign up for my newsletter and have them delivered right to your inbox. This is somewhat helpful, but the terminology and lack of association with anything visitors ultimately see is driving me nuts. I’ve set up several things on FB (I’m going to call them all “pages”) that ended up not being what I wanted. Some I simply abandoned, others are limping along in spite of them not being what I wanted. Because if you make a mistake in your initial choice of page type, you don’t know until you’re finished setting it up, and then you’re screwed because it can’t be undone. Several times I’ve tried to set up pages like a discussion page on a blog. I want my branding and I want interactive discussions. Once I ended up with something that inserts user comments in the left-hand side-bar and they have to be approved to be visible; they’re really not for discussions, but seem to be simply for questions. Another time, I was trying to set up the same thing and ended up with a page that is supposed to be open and allows anybody to post anything. Instead, what I got forces people to request to join and then I have to approve each one individually. This is totally counter to what I wanted. That forced (and needless) opt-in keeps people from engaging. No matter what options I select, I’m unable to disable that forced opt-in. Nowhere in the setup did I see anything saying this type of page requires visitors to join and be approved before they can engage. How are you supposed to know that up front? In both cases, you have to choose your name and set your URL before you get to the point where you realize you picked the wrong type of page. At that point, you’re stuck because you can’t change the page type and can’t reuse the name or URL. It’s an incredibly poor design — you’re supposed to know what you’re going to end up with before you ever get started! If you don’t, you’re screwed. Your name and URL are permanently assigned to a page you’ll never use. Congratulations! Your brilliant branding strategy just got flushed down the toilet. I’ve come across lots and lots of pages that allow this simple form of discussion board that don’t force visitors to request to join. But I have no idea what they’re called or even how to create that type of page from the outset. The selection options are mired in jargon that talks about everything except what’s on the doggone pages and how you manage them. Perhaps this is the result of focusing entirely on benefits and not enough on features. No discussion about page and user-facing features. Anywhere. Is that supposed to be a feature or a benefit? Regardless, it’s confusing as hell. This seems to be particularly significant if you’re going to run FB ad campaigns, although nobody really discusses it in so far as how you might want to think about it BEFORE setting up the page on FB. It’s just something you end up with, as if nobody cares. If that’s the case, then why does FB impose this constraint on FB ads? I can’t imagine anybody with any experience running FB ads treats this as a total afterthought. Finally, some of these pages constantly barrage me with popups and slide-ins from FB imploring me to essentially pay them to show the page to more people. Not all. But I have no idea why some do and others don’t. And I guess it’s also a reflection of making a poor choice at the beginning, because most of these pages I’m not the least bit interested in promoting, while others that I would like to promote never even bring it up. Even though I’m a programmer and think I should be able to figure this stuff out pretty easily, I have no flipping clue how to map the various choices on the setup pages with any sense of expectation of what I’m going to end up with when I’m finished. I find it incredibly frustrating, and the available help is nothing but jargon and examples that probably make sense to a college student who wants to show off their science project or promote a club meeting, but is totally meaningless to me as a business person and an advocate for various causes that interest me. At last this all makes sense and why it is important to have all 3 types of Facebook pages. Tyhson, thank you for commenting. I am very happy this blog post made it more clear for you.